We have reached the halfway milestone in the DEx and Mastercoin Wallets 300 BTC bounty. There is now a tabulation of the results based on feedback from participates and 150 BTC will be paid out as well as corresponding MSC soon thereafter. This post covers the major accomplishments throughout this contest as well as the results and judging methodology. The methodology for determining contest allocations continues from the previous $25,000 Code Contest which ended in October 2013. Participants reported the work that they had done during the contest. Participants undertook cross-evaluations to provide feedback. Normalize all feedback to fix those which don’t add to 100%. Attempt to determine how careful each person’s feedback was (i.e. the same % for everyone is not very careful, but different percentages for each person with detailed comments on how you chose those percentages is very careful). Weight each person’s feedback by how careful they were. Get a percentage for each person based on the combined weighted feedback. Perform a second pass through weighting step, changing each person’s grade for themselves from zero to the result from the first pass. For the sake of brevity these results are highly compressed and you are urged to follow the link to the dev thread mentioned above for details. My wallet software is coming along nicely, this now has full DEx support. Still some work needed, the UI needs a good clean up and there are still a lot of bugs on my outstanding list. Lots of user-orientated stuff (for example bitcoin config autodetection). The biggest change in v2 of the Masterchest library is of course DEx support. All DEx messages are supported, and the library handles both encoding and decoding functions. Also some nice performance gains achieved through tuning (recursive inputs etc) which speeds up blockchain scanning in the respective software that use it. v2 of the Engine has also been rewritten to support the new DEx messages and incorporate DEx state processing. Also runs the consensus system – v2 includes test MSC. For the results of the engine please see the masterchest.info website – the engine is what populates the databases for it. v2 of the website brought with it – you guessed it – DEx support (a theme is appearing ) and a significant redesign. Charting is real-time & once there are more trades taking place as we ramp this up I’ll open up the view options other than 60-day. Masterchest CLI is your bread & butter ‘does what it says on the tin’ utility. It simply wraps the Masterchest library in a CLI wrapper so you can call the functions from the command line. Consolidated all the various discussions on transaction storage and drafted an amendment to the spec which would explicitly define how this is done. Built and introduced the Masterchest consensus system to put the verification API (credit Tachikoma) to use in automated testing. This monitors each address and evaluates differences across the various implementations. Rewrote the rules on Class A to allow for a variety of edge cases that had appeared on the network but were technically invalid per spec. These transactions could be decoded via ‘Peek & Decode’ and it was hurting consensus having ambiguity on these transactions. Create multisig parsing of Simple Send and Dex transactions from blockexplorer.com and blockchain.org. Payment stage for accepted offer. Using the hybrid wallet for paying the accept offer. Design icons for all the transaction types and backgrounds to indicate each transaction DEx’s status. Implemented the icon / background scheme with transparent icons and CSS classes and integrated in masterchain.info site. Responded to users and testers feedback (on mailing list and the forum) and improved usability of the transactions sending form. Tested the status of individual transaction types on masterchain.info using the icons mentioned above and hover HTML message that I also implemented. Test signing of all possible DEx transactions within masterchain.info. Can parse, save and display Mastercoin DEx messages. Has a dedicated page to display distributed exchange data. Has a graph for latest selling prices based on DEx data. Can create Selling Offers by creating raw transactions that you can sign using your own Bitcoin wallet software. There are now three types of charts: Weekly/Month/Yearly transaction graphs. 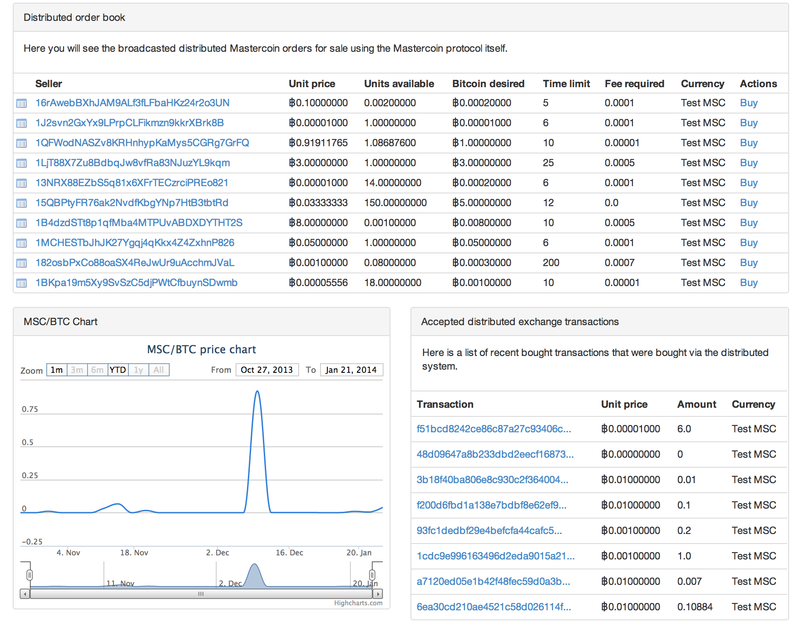 Mastercoin-explorer comes with a full rSpec based test suites that automatically tests various different outcomes for parsing Mastercoin transactions. Can now display DEx order book. Supports all creation and broadcasting of all DEx related messages. There is an automatic installer script that can now install the client with one command on Debian/Ubuntu and Fedora/Redhat. 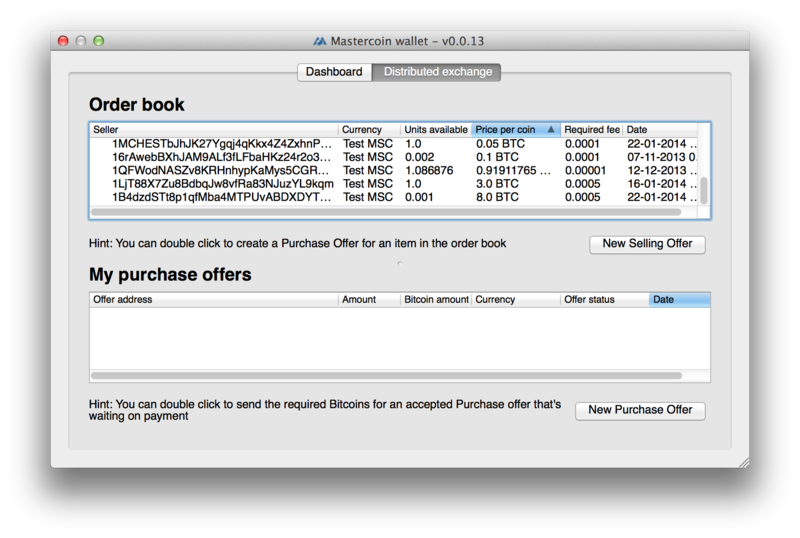 Mastercoin-ruby is the encode/decode lookup layer that can lookup transactions. Support for decoding/encoding of DEx messages is now supported in this library. This library also comes with accompanying rSpec suite. Wrote a specification clarification for reserving funds for DEx messages. Wrote a few general clarifications for Selling/Purchase offers. Updated the spec to reflect we ignore Mastercoin transactions for purchases. Published https://github.com/marv-engine/QA/blob/master/MastercoinDistributedExchangeTestPlan.md which describes the strategic approach for Dist-Ex testing (rigorous, comprehensive, repeatable, defensible). Working on test requirements for each transaction type – the next level of detail, then test procs can be written for each candidate application. Submitted pull requests to improve & clarify updating/canceling a Sell Offer (tx=20). Wrestling this to closure. Identified other transaction definitions that need to be clarified. Contributed to early API design which was unfortunately abandoned. Additionally to grok grazcoin’s mastercoin-tools (https://github.com/grazcoin/mastercoin-tools) I forked it and have started to write unit tests. Great, but *nobody* cares about what minor things the guys have been doing. We only care about one thing you ignore in every update: When will Mastercoin finally release DEx or other products? I mean honestly, why can’t you just give an update on that?! I’m still looking forward a working true wallet, there’s none was working for me as a true wallet.